Nikola selected the greater Phoenix area for a manufacturing headquarters that will turn out the company’s hydrogen-electric Class 8 trucks. It plans to bring more than $1 billion in capital investment to the region by 2024. “We will begin transferring our R&D and headquarters to Arizona immediately and hope to have the transition completed by October 2018. We have already begun planning the construction for our new zero-emission manufacturing facility in Buckeye, which we expect to have underway by the end of 2019,” Nikola CEO Trevor Milton said in a statement Jan. 30. The plant will be a 1-million-square-foot facility located on 500 acres on the west side of Phoenix in Buckeye, Ariz. It will employ 2,000 people, according to Nikola, which will relocate its headquarters from Salt Lake City. Nikola has reported its Class 8 trucks — for which it has 8,000 orders — are scheduled to be road-tested in 2019 and manufactured in 2021. The first 5,000 will be built by Fitzgerald Glider Kits, based in Byrdstown, Tenn. The selection of a permanent location came after 12 months of looking at 30 sites in nine states. Nikola selected Buckeye due to Arizona’s pro-business environment, engineering schools, educated workforce and geographic location that provides direct access to major markets, it said. The site is located at one of the entrances to Douglas Ranch/Trillium, a master-planned community being developed by El Dorado Holdings and JDM Partners. This community is projected to be home to more than 300,000 residents. 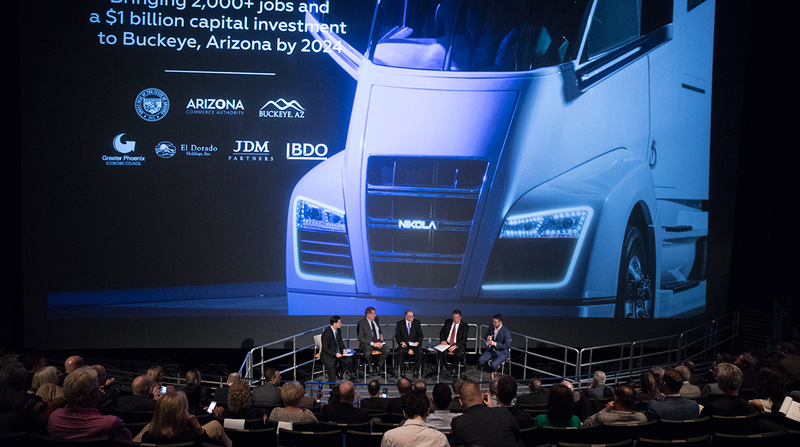 “The Greater Phoenix region is elevating its brand as a hub for innovation, and companies such as Nikola have taken notice,” said Chris Camacho, CEO of the Greater Phoenix Economic Council. Meanwhile, independent engine maker Cummins Inc. continued its push into commercial vehicle electrification with the announcement it has acquired Johnson Matthey’s UK automotive battery systems business, a subsidiary of Johnson Matthey that specializes in high-voltage automotive grade battery systems for electric and hybrid vehicles. The acquisition closed on Jan. 31. Terms were not immediately disclosed. As part of the acquisition, Cummins and Johnson Matthey also agreed to collaborate on the development of high energy battery materials for commercial heavy-duty applications, according to the Columbus, Ind.-based company. “The addition of Johnson Matthey Battery Systems’ technical expertise and customer base in markets that are more rapidly adopting electrification further positions us as a global energy storage supplier,” Cummins Chairman and CEO Tom Linebarger said in a company release. As one of Europe’s largest lithium-ion battery system suppliers, the business has 50 employees and is based in Milton Keynes, United Kingdom. “In divesting our automotive battery systems business to Cummins we can focus on our strategy of expanding our eLNO [enhanced lithium nickel oxide] platform and developing commercial battery materials for the full range of transport applications,” Johnson Matthey CEO Robert MacLeod said. In October 2017, Cummins announced the acquisition of Brammo, which is known for designing and developing low-voltage battery packs for mobile and stationary applications. The addition of Johnson Matthey Battery Systems high-voltage battery expertise now provides Cummins with the capability across the entire range of energy storage options. “What differentiates us is our ability to help customers succeed with high quality products across the spectrum of power solutions they use, whether it’s electric, diesel, natural gas or other energy solutions,” Linebarger said. Cummins noted it will continue to explore other opportunities to add electrification capabilities as it prepares for delivery of electrified powertrains to customers in 2019. Also, in August, Cummins Inc. unveiled a concept truck of its own with a production-intent Cummins electric power module.